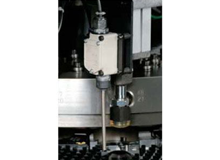 Muratec introduced world’s first servo driven punch press in 1994. Since then we our industry leading technology has evolved to meet the next generations needs. 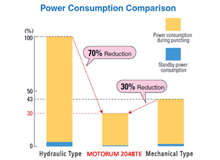 Here is the latest in our award winning Motorum series! 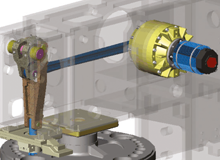 The ram drive of M2048TE has incorporated CFRP in the part of toggle mechanism connected directly to the servomotor making it lighter in weight and more rigid. The new drive mechanism and the replacement of the alternating movement decrease vibration by 65%. In addition, a reduction of motor heat saves energy in cooling and the resuscitation of electric energy when braking. 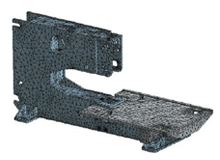 Improved stability in the punching process using 12.5% thicker material for the press side frames and improved stiffness of base component. An environment-friendly eco-machine, Motorum uses the energy it needs only at the time of punching, thanks to the servo motor drive mechanism. Steel balls are effective for supporting thick work sheets, and brushes are located to keep work sheets flat. This combination table is suitable for thin and thick work sheets. Prevent major damage to the machine. Crash sensors stop the machine when material curves upward toward the turret preventing a collision. 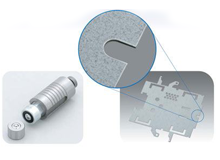 Deburring and pinching operation using the ball bearing manufactured originally by Muratec. 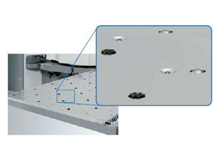 Two bearings from top and bottom sides removes the burr of the edge both sides, upper and lower, of the punched parts simultaneously by pinching the edge of the punched sheet along with the path.